The Karnataka Association of Resident Doctors (KARD) have requested to meet the Chief Minister of Karnataka tomorrow at 11 AM in Bangalore. This development follows the indefinite strike announced by the resident doctors group in Karnataka since yesterday, especially because of the low stipend paid to the resident doctors. After the initial round of discussions between the KARD and the concerned government authorities, reportedly held today. Speaking to Dr. Anudeep, General Secretary, KARD said that in today’s meeting only the Karnataka government has only given assurances for increase in stipend to the resident doctors, However the amount of hike still remains ambiguous, as no exact commitment on the percentage of hike or timeline has been made yet. 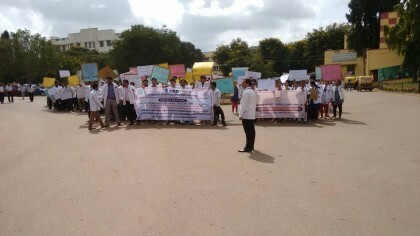 The strike follows the misery faced by the resident doctors in the state-run hospitals including long working hours, no prescribed number of casual leaves or medical leaves in their curriculum, security, more specifically the meagre pay scale that as the letter quotes makes the residents in Karnataka the one of the least paid resident doctors in the country.